In China, a country with five thousand years of civilization, Christianity is often portrayed as a relatively new arrival. But in this vast, rapidly modernizing country, Christian churches have brought about the integration of the sacred elements of Western culture and Chinese grass-roots communities to form a special kind of public space. Artist Yuanming Cao has traveled to hundreds of villages in Suzhou, Anhui, upon which American novelist Pearl Buck’s timeless "The Good Earth" (Nobel Literary Award in 1938) was based. 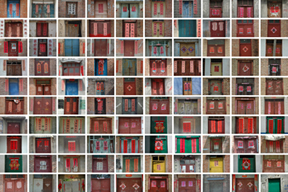 This exhibition presents a series of photographic collages completed in 2004-2008 focusing on Christian churches in the rural areas of Central China. “Strangers No More” is presented in collaboration with the Purdue Center on Religion and Chinese Society and the College of Liberal Arts.